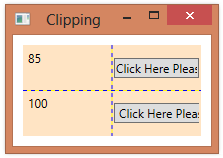 Clipping and/or resizing of elements happens after layout transforms have been applied. 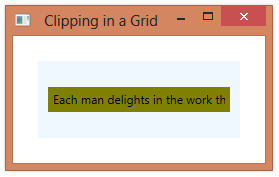 This means that the layout-transformed object is clipped/resized to fit into the Grid. You can, however, applied a render transform to an object to allow it to extend outside the bounds of the Grid, because this step happens after clipping/resizing. Below, the first button is rotated before layout, so the rotated button is sized to fit into the Grid cell. 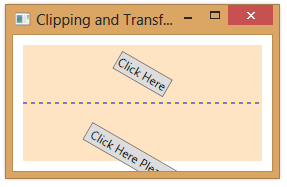 The second button is rotated after layout, so is not resized. <Button Grid.Row="1" Content="Click Here Please"
A Grid appears to clip its child elements, in that the elements are constrained to fit within a particular grid cell. In reality, however, a Grid is often resizing, rather than clipping, the child elements. 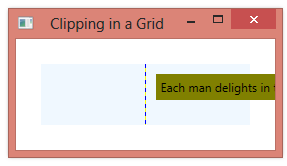 If the child element does not specify an explicit size, the Grid will ask the child to be a smaller size, rather than simply clipping it at the grid cell boundary. 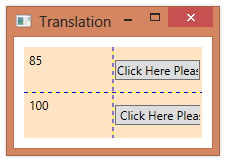 Below, the top Button does not have an explicit width, but the bottom Button does. 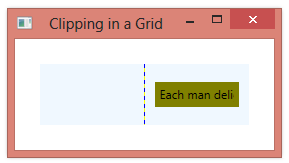 As we shrink the Grid, the top button will be resized, while the bottom button will be clipped. The labels indicate the actual button widths. Grid.Row="1" Grid.Column="1" Content="Click Here Please"
While a Canvas panel does not clip its child elements, a Grid does clip child elements. The child elements are clipped even if you set the ClipToBounds property of the Grid to false. Recall that you can set the width of a column in a Grid (or height of a row) in three different ways: auto, explicit size, or star sizing. In the example below, we’ve set the first and third columns’ widths to be Auto and put them in the same SharedSizeGroup. Setting the width of the first column to 20 causes both columns to use that width.